What they are talking about is a haybox. This was very common in the 1700 1800’s. I do this with a laundry basket and some towels. Get your food hot/boiling. Put a towel in the bottom of the basket, wrap with more towels, cover with towels and leave for 8 hours or whatever. Doesn’t cost a thing. You’re exactly right, thanks for pointing that out. 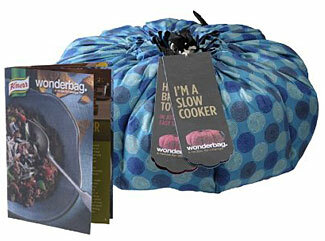 As I said, $50 seems awfully expensive for one of the ‘official’ Wonderbags. Free Solar Energy Spreadsheet/Calculator What is the Most Efficient Form of Cooking?